UX Professionals, Interaction & User Interface professionals, Digital Product Managers, Web Content Strategists, Market Research Professionals. Andrew Schall has over 10 years of experience as a UX researcher and designer and is currently Director of User Experience at SPARK Experience Design, a UX consulting firm outside Washington, DC. He is currently a Ph.D. candidate in Human-Centered Computing at the University of Maryland, Baltimore County. Andrew has worked with numerous public and private organizations to use eye tracking as part of their user-centered design process including organizations such as Aflac, Fossil, GlaxoSmithKline, NASA, PBS, and U.S. Department of Energy. He is a frequent presenter on eye tracking, speaking at conferences including Human Computer Interaction International, User Experience Professionals Association, and User Focus. 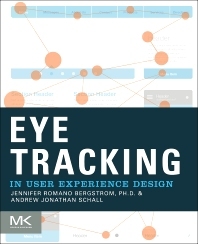 I found this book extremely useful as we are trying to help our organization understand how eye tracking can be used in our user research projects. I loved that the book includes so many different real-world examples. There really aren't that many eye tracking resources out there for UX people and I'd highly recommend this one.